Sautéed turkey breast cutlets, seasoned with chipotle powder, are served with a spicy fresh salsa of charred corn, red onion, cherry tomatoes, lime and fresh cilantro. For Salsa: Char corn in nonstick skillet over medium-high heat, stirring often, about 3 minutes. Add onion and oil to skillet and sauté 2 minutes. Add tomatoes and cilantro and sauté 1 minute. 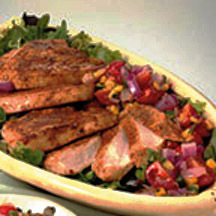 For Turkey: Sprinkle cutlets with chipotle powder. Add turkey and sauté, turning once, about 6 to 8 minutes or until cooked. Add broth and quickly cook to heat through, spooning sauce over turkey to blend flavors. Portion turkey and sauce over bed of mixed salad greens.